Open Scholar at the OpenAIRE/COAR Joint Conference: “Open Access Movement to Reality: Putting Together the pieces” – Open Scholar C.I.C. Aside from presenting Open CIC and the LIBRE project, our main argument is that article retractions are proof that the traditional peer-review process is failing and unable to cope with the volume of new digital literature. At the conference, I introduced the open publication as society’s self-defense mechanism and a way out. The Independent Peer Review Initiative (IPRI: http://www.openscholar.org.uk/independent-peer-review-initiative), co-authored by Open Scholar CIC members last November, was publicly launched at the event as the open peer-review successor to the Budapest Open Access Initiative (BOAI: http://www.budapestopenaccessinitiative.org/read) which was issued on Valentine’s day in 2002. We invite you to sign and to encourage your colleagues and host institutes/academic societies to join the Initiative. The campaign is gathering momentum and has over 104 signatories already and is generating a buzz on Twitter: http://twitter.com/search?q=http://www.openscholar.org.uk/independent-peer-review-initiative/. The other speaker in Session 5 was Dr Kamila Markram, co-founder and CEO of the “Gold OA” publisher Frontiers (http://www.frontiersin.org ). Kamila gave an excellent talk that described, among other things, how Frontiers has developed large and extensive academic infrastructures to cope with the huge volume of submitted articles, and how it is embracing concepts such as having reviewers sign their reviews and allowing subscribers to be able to make comments. It was great to see also Frontiers engaging in public outreach with initiatives such as their web-based scientific journal with an editorial board of kids called “Frontiers for Kids”: http://kids.frontiersin.org. A large concern raised was that, the use of computer algorithms for assigning the tens of thousands of reviewers working for Frontiers to the millions of submitted manuscripts received, is creating yet another degree of separation between authors and editors responsible for guaranteeing quality and integrity. This point was also made by William Gunn of Mendeley in his excellent talk on metrics where he explained how the use of “recommender algorithms” is becoming more frequent. William also pointed out that the irreproducibility of scholarly results is a serious issue and perhaps much more serious than article retractions. Importantly for LIBRE and our philosophy regarding multi-parametric indices, William explained that, in terms of evaluation metrics, Mendeley for example, leaves users free to select the usage data parameters they want to rank content. This is very encouraging as are the development of new open source bookmarklets (e.g. Pundit: https://thepund.it/ and Altmetrics: http://www.altmetric.com/bookmarklet.php) which we can incorporate into LIBRE thanks to its Drupal architecture. My overall impression was that colleagues working at data providers, institutional libraries and those developing open source technical solutions for knowledge sharing are making huge advances and are generally highly aware of the problems and willing to experiment. One thing LIBRE should keep in mind is open data stacking – i.e. ensuring that each scholarly communication has an author ID, their affiliation ID, DOIs for articles, datasets and code and citation metadata with room for expansion (e.g. by adding more handles to the “stack” in the future). This is in response to the need for greater harmonization between existing metadata providers and to provide flexibility. Furthermore, the importance of seeing scholarly communications as a package (e.g. article + data + code + reviews) was emphasized by one comment that, “evaluation committees in the USA now request the last 5 ‘research products’ rather than the last 5 peer-reviewed publications”. This reveals a significant shift. Colleagues repeatedly expressed the need for existing data structures to be deconstructed and reconstructed so as to address these needs. However, while extremely useful guidelines and support material on open access and data management is being produced by the University of Manchester but, only Open Scholar CIC is campaigning for the incorporation of peer review at the article level in repositories with platforms like LIBRE. An important consideration discussed was text mining and licensing of re-use data. Prodromos Chiavos from the Greek Free Open Source Software Society (http://www.ellak.gr/greek-free-open-source-software-societygfoss/) mentioned the Open Metadata License (https://joinup.ec.europa.eu/category/licence/isa-open-metadata-licence-v11) which might be useful for the purpose of aggregating metadata and then transforming them (e.g. enrichment, translation, repackaging – aka “publishing” etc.). Our attendance at the event provided us with an excellent opportunity to get a clearer view of what is happening at the global level regarding open access, digital repositories and linked open data, and to engage with a wide and receptive audience. Many organizations were present (including the EC, RedCLARA, Mendeley, OECD, WorldBank, PLOS, etc) and their representatives engaged actively in the discussions and highlight the need to develop the open access infrastructure. For example, the World Bank has invested a lot in (gold) open access to their data and publications and their OAI-PMH compliant Open Knowledge Repository (https://openknowledge.worldbank.org/) which can be harvested was presented. Overall, there was a positive attitude towards open access and data sharing but there is clearly strong preferential attachment to gold open access publishing (e.g. Frontiers) without any discussion of how costs are being transferred to the authors and their host institutes and the new publication paywall being erected. In addition, while stakeholders were quick to embrace free open data and open scholarly communication solutions, there is inertia at the institutional level to fund such initiatives. As such, the transition from open access movement to reality alluded to in the title of the conference is yet to happen. That is why Open Scholar CIC and LIBRE are gaining supporters worldwide and why the launch of the Independent Peer Review Initiative is so important. blog Academic Publishing, LIBRE, Open Peer Review, Open Scholar. permalink. 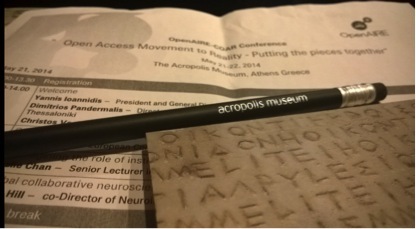 Thank you for sharing the really interesting report of the OpenAIRE-COAR 2014 Conference. I was really glad to read this post and get some additional information about the Conference, which by the way was packed with interesting presentations and allowed us to get in touch with people passionate about Open Access and digital repositories.